We will have a small selection of goods for sale at Hive & Forge in Salem, MA from April 9 to April 14. We will be making a special in-store appearance on the 13th to promote our products and chat about anything you want to know! We love this space so much, and host lots of events here, so we are psyched to have some retail space for a short period of time! Restorative Yoga, Tea, and Herbal Facials! Join Chrissy for an afternoon of self-care, herbalism, and blissfully juicy gentle and restorative yoga. Using the power of plants, both internally to nourish as tea and externally to soothe winter skin, you will be treating yourself like the divine yogi or yogini that you are! Learn about the medicinal and nourishing properties of plants, while you sip specially blended herbal infusions, and soak in restorative yoga postures before, during, and after using all natural and handmade beauty products (e.g., herbal scrubs, masks, toners, and lotions) by the Chaos Factor. You will leave feeling completely refreshed and renewed, and your vessel will thank you for it! Guided meditation in savasana. and reiki/massage assists will be offered as well. Join us at The Cellar beneath The Hotel Salem for an evening of music, drinks, and darkness. Finish up the holiday shopping for your oddest friends and relatives among a curated list of vendors (full list TBA). Music will be provided by local DJ Zombi. Cash bar by The Cellar. Entry will be free, though attendees are encouraged to participate in a raffle where all proceeds will go to the Salem food bank! Watch for details on what prizes are up for grabs! As a European inspired beer hall we thought it might be fun to put together a hyper-local Christmas Market out in our biergarten highlighting local "makers", as well as take some of the pressure off holiday shopping with the inclusion of BEER. Please join on December 1st and 2nd for our holiday market! Located in the historic Old Town Hall in Derby Square. The weekend will be filled with the best local artisans and sellers. 25+ vendors including vintage, jewelry, soap/body care, art, handmade and everything in between. Check out our lineup of local makers and vendors then come #eatbrunchbuystuff! The #ESomMarket is a monthly market in Somerville featuring local makers, artists, and small businesses. Since 2015, our mission has been to support these communities by providing a space for people to show their work and to connect with one another. We run the E-Som Market one Saturday a month from 10am - 3pm (with two markets a month in November and December!) We feature a special Saturday brunch and a lineup of local vendors of all kinds, focusing primarily on locally produced products. We provide the tables, and there currently is no fee to participate. All we ask is that vendors promote the market and tell their friends about us! Join Salem yoginis, hedge witches, and moon mamas, Rebel Yell Yoga (Chrissy), The Chaos Factor (Chrissy and Lauren), and Dark Moon Tarot (Kris) for an evening of new moon magick to celebrate Scorpio season. Hive and Forge will be hosting this yoga practice, infused with tarot, astrology and herbal magick, among their eclectic collection of arts, herbs, and oddities. Come raise the vibration with like minded individuals, align your mind, body and spirit through yoga, and spend time in sacred circle to cultivate new beginnings and set intentions. Come shop the area's most peculiar vendors! The Oddity Marketplace will surely delight collectors of interesting curiosities; with vendors offering the strange and the unusual! Featuring the area's most peculiar vendors. Featuring record dealers and doughnuts! Featuring vendors of vintage clothing, vintage home decor and vintage commodities! Stay Tuned for more details! Vendors and full programming will be announced over the next couple weeks. The collective will be transforming Derby Square into a delightfully ghoulish Night Market! Retonica will be helping us set the mood with lights so don't worry if the sun goes down.. That's when the fun really starts! Featuring your favorite vendors, special guest performers and more! As an AMAZING bonus, the fine folks from Artists' Row - Salem, MA are also concocting some delightful programming and will be staying open late! This is hopefully the start of a new annual Salem tradition and we hope you will join us! A special visit from Moonrise Fae, can't have a night market without faeries! Join us for The Salem Flea August Market! 35+ vintage, handmade, jewelry and art vendors. Live saxophone and ukulele performers. The Chaos Factor will have a booth by The Lobster Shanty and be selling all sorts of lovely art, prints, jewelry, and herbal health and wellness goods, including 3 new product lines inspired by Summer Love, Mermaid Magick, and 2-Wheeled Wanderlust. Summer solstice, or Midsummer, is the longest day, and most fertile time of year, representing fruition, fulfilment, and consciousness. With the sun at its zenith, we will align our personal zeniths of power, manifestation, and self-awareness with the elements, while dancing between the earth and sky. Chrissy will lead you through 60 minutes of vinyasa flow to open powerful personal pathways of awareness, and to harness the intense fiery energy of the solstice. While focusing on the connection to the elements, you will further connect and expand through Tarot, and the 22 life lessons represented in the Major Arcana. Class is limited to 22 attendees, and upon arrival you will draw a Major Arcana card to bring awareness to one of the 22 life lessons contained within the Tarot deck. This card will serve as a focal point for meditation and as a sort of "personal spirit guide" throughout your practice. After yoga class concludes, you will spend the remainder of the time in the solstice circle, being lead through a midsummer meditation honoring nature, the elements, and the bounty the earth provides in high summer! The circle will focus on earth medicine through plants, devotion to and reverance for the natural world. In collaboration, Dark Moon Salem (Kris) and the Chaos Factor (Lauren and Chrissy), will be providing gifts as part of your investment in YOURSELF! More incentive to bring your energy to the lawn! You will receive the beautifully printed Tarot "spirit guide" card, as previously mentioned, and you will also receive a printed birth chart (with brief written explanation) for self-empowerment by understanding your Rising Sign, Sun Sign and Moon Sign on a conscious level. Additionally you will receive a gift of herbal wellness in the form of special solstice oil blends, herbal blends/products, etc. from the Chaos Factor! (TBD). Please join us and ring in Summer Solstice in sangha, the community of practice!! ***Important note: each student must sign up separately for this event due to class size restriction and the need to individually sign the waiver as part of the eventbrite purchase. Also, we ask that all attendees be prepared to participate in the entire 90 minute event. Options to do yoga or meditation circle only are not available at this time. We will be in touch once you have purchased your spot to request information for your birth charts. Additionally, a portion of your investment will be donated to the House of the Seven Gables, as a charitable donation. Thanks for your cooperation! Bring a mat, water, and any props you may need for yoga. You may also bring any offerings for the solstice altar. Please arrive approximately 15 minutes prior to class starting. Join Rebel Yell Yoga, Creative Collective MA, and an amazing local creative crew for a two-hour Beltaine celebration at the historical Witch House in Salem, MA. 5) Meditate/converse with your community. Upon signing up for the workshop, you will receive an email asking for your birth date/time/place details so that Kris can prepare your charts and readings. Option to donate more onsite will be available. Due to space limitations, the workshop is limited to 20 people, and will be split into groups of 10. One group will practice yoga from 6-7pm, while the other group spends time in the Tarot Salon. The groups will switch from 7-8pm so that everyone participates in all aspects of the workshop. There is no option to do one or the other. We apologize in advance for any inconvenience. Tickets are on sale until 4/25/18! We are excited to offer a creative endeavor resulting from collaboration between local, female-owned businesses. We will conjure beautiful energy and welcome the height of spring as a community! Please join us! Come shop the area’s most peculiar vendors at our Oddity Marketplace! There will be vendors offering oddities, curiosities, the strange and the unusual! The event will take place on the 4th & 5th floors of Mill No.5 from noon-4pm! Looking for a last minute gift for your sweet? Looking for a last minute gift to celebrate Galentine's? Do you just LOVE supporting local artists? 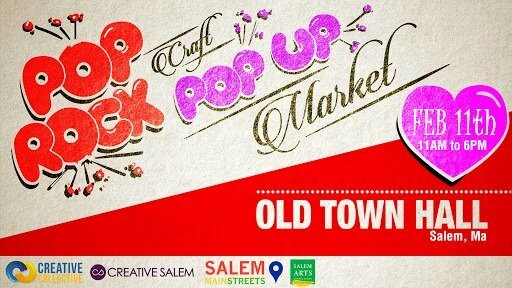 Check out the first Pop Rocks - A Pop Up Craft Market, an exciting addition to the Salem So Sweet Festival! Artisans from all over the Northshore will be at Old Town Hall from 11-6 selling their wares so stop by to get something for your loved ones (or yourself!). A sweet bag of Pop Rock candy will be given to the first fifty guests, so get there early! Sweet Bangs and Chrissy V.
Vendor slots are full but we still want to hear from local artisans! Email info@creativesalem.com for future market details.